Four students from the S.I. Newhouse School of Public Communications and the College of Visual and Performing Arts (VPA) have been named 2014 YMA Fashion Scholarship Fund (FSF) Scholars. 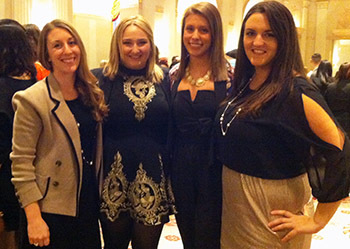 VPA fashion design majors Taylor Cioffi ’16 and Michelle Lee ’16 and Newhouse advertising majors Katelynn Moreau ’14 and Jacqueline Soldano ’14 each won $5,000 scholarships from the YMA FSF and were honored Jan. 8 at the YMA FSF Geoffrey Beene National Scholarship Awards Dinner in New York City. The $5,000 FSF scholarships are awarded based entirely on merit, taking into consideration the applicant’s GPA; the completion of a case study project; a personal essay detailing his or her aspirations, job experience, community service and how the scholarship money would be spent; and a phone or in-person interview with a YMA FSF ambassador. Founded in 1937, the FSF is a national, nonprofit association of influential members of the fashion industry. It is dedicated to promoting fashion arts and business education by granting scholarships to talented students and facilitating internships, mentorships and career programs so the students become the next generation of leaders in the fashion industry. Since 1971, FSF has awarded more than $8 million in scholarships to more than 900 students nationwide. Scholarship grants are set up by FSF in an effort to recruit, mentor and train the best students from member schools. For more information, visit fashionscholarshipfund.org/.